That day I read KenWooi's post and made me realized that my mom is....different? She DID NOT WANT TO ADD ME INTO HER FRIEND LIST. At first, she really tested my patience cause for every single thing she would bug me for my assistance. 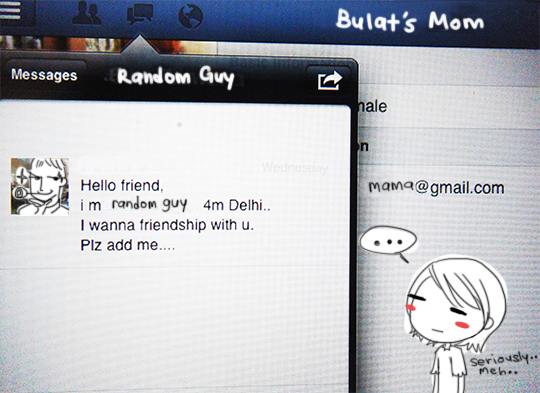 Dahlah, she don't want to add me as friend but need my help for everything! *pifts* where can like this wan?! Spam each others' walls and comment on each others' photos like non stop! The wall is basically like a chatting place for them. It is super active-_- Her Facebook page makes mine looks like the Sahara desert-_- (dusty and dry) There is never a day she doesn't get any notifications. And they can be up till early morning spamming on each others' wall. They even plan gatherings and eateat sessions on Facebook! O_O Keng a not? To me it is lorh! p.s// my mom is those kind of mom that goes karaoke with my friends till 3am in the morning...without me-_-!! Wow, now that's a cool mom! Haha. If I'm you, I'll probably will brag about my mum all day long! Haha, your mum is happening weh! HAha, that's why I never wanna teach my mum how to really use Facebook LOL. Coke cures mouth ulcers? HAHAHAHA how to not teach?! my mom will say 'you don't love your mom anymore?" when i don't choi her....-_-! aw you've got such lovely illustrations! too cute! ^^ thnk you~~ so do you~! 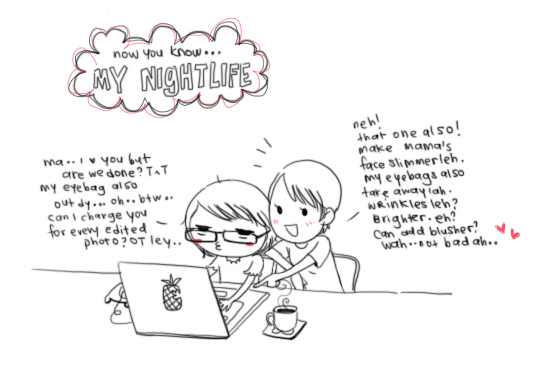 Your mom is really so modern, by the way I love your blog with so many cute and nice illustrations.